Delaney believes this commitment to students’ futures is essential to Kogod’s success. Prioritizing student outcomes means that graduates secure better jobs, eventually generating more opportunities for their peers. This positively affects employers’ perceptions of the school, which elevates Kogod’s reputation as a leader in collegiate business education. A self-described “long-time academic,” Delaney joined the Kogod School of Business on July 18, 2016, as the school’s dean. Delaney’s resume is brimming with experience in nearly every area of academia—from former dean positions to teaching as a professor. 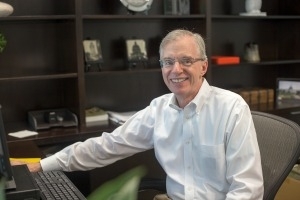 The past decade he served as Dean of University of Pittsburgh’s business school, capitalizing on his experience at other institutions as an associate dean, faculty member, and department chair. Delaney is excited to guide Kogod towards generating better career outcomes for students. Focusing on this goal also helps him meet another: uniting the school with a strong and motivating vision. He knows that in an organization, success does not depend on one person’s agenda; it is contingent on the commitment of the entire group. He is a fervent advocate for teamwork, especially when working towards a complex, big-picture goal like improving students’ futures. “Our success rests on the work that we all do. We’ve got to collaborate to get better,” Delaney says. Having passion for his job is not difficult for Delaney. He started as Kogod’s dean just a month ago, and has already assembled a long list of attributes detailing what makes the school a distinctive place to study. One of the most compelling characteristics is Kogod’s focus on experiential learning, an approach to education rooted in practice rather than academic theory. Kogod students have the added benefit of practicing what they learn in the vibrant, progressive environment that is Washington, DC. Studying in the nation’s capital means they have access to leading institutions where they can apply their knowledge through internships, projects and full-time jobs. “For students interested in the intersection of business and government, public service, or international affairs, this is an ideal place for them,” says Delaney. Despite Kogod’s offerings and Delaney’s strong ambitions, he admits that leading the school will not be easy. Higher business education is a tough market, especially in an area with so many other well-established universities. As Delaney settles into his new role, he is looking forward to learning more about Kogod and how to best support the school. He is sincere in his convictions to better students’ futures and unite faculty and staff in pursuit of this common goal. His deanship promises to be one of hard work, growth and unity.